Hey y'all! Kelli, here, ready to share a card I made for the blog today! First, I made an alcohol ink background using several different shades of alcohol ink- most notably I used Pink Flamingo, Purple, and Rose Gold. 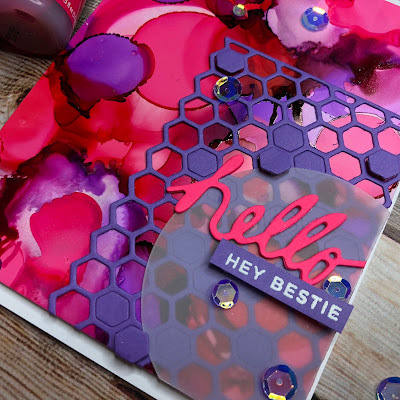 Then I cut the Teresa Collins Honeycomb die out of purple paper, a circle out of vellum, and the Teresa Collins Hello die. Then I was just a simple assembly of the card! The sentiment is from CZ Designs and Simon Says Stamp. I added a few Studio Katia sequins and finished it up! I LOVE color! This is so bright! Would have never thought to mesh these colors! They are awesome together!